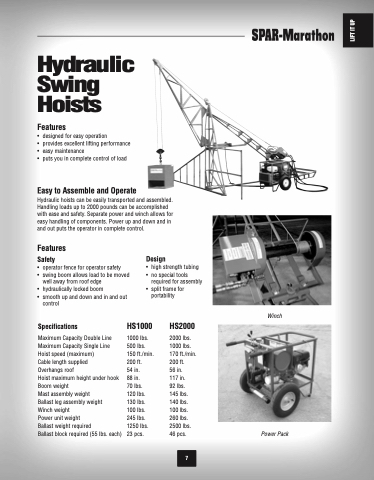 Hydraulic hoists can be easily transported and assembled. Handling loads up to 2000 pounds can be accomplished with ease and safety. Separate power and winch allows for easy handling of components. Power up and down and in and out puts the operator in complete control. 1000 lbs. 500 lbs. 150 ft./min. 200 ft.
70 lbs. 120 lbs. 130 lbs. 100 lbs. 245 lbs. 1250 lbs. 23 pcs. 2000 lbs. 1000 lbs. 170 ft./min. 200 ft.
56 in. 117 in. 92 lbs. 145 lbs. 140 lbs. 100 lbs. 260 lbs. 2500 lbs. 46 pcs.